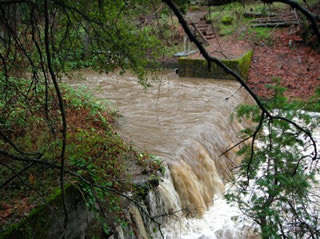 A recent article in the Sacramento Bee entitled "California creeks, levees may be the next battleground for public access" made mention of a visit by Shasta County Sheriff Eric Magrini to Marily Woodhouse's house concerning water quality samples she had been collecting from Sierra Pacific Industries (SPI) land. Despite the issue of legal or illegal access claimed by SPI in the article, what we are really seeing here is bullying by SPI because they are unhappy about the attention being brought upon themselves because of the impacts from their widespread clear cutting practices. This is not the first time SPI has used bullying tactics, back in the year 2000 SPI filed several "SLAPP" Strategic Litigation Against Public Participation lawsuits against the Yuba Nation; a group of activists opposing some proposed SPI clear cuts near Nevada City, and Brian Vincent an organizer amongst others. SPI even went as far as to charge the activists with "timber theft" for using logs from the timber sale to construct a tripod to block log truck access. Corporations such as SPI have and will use bullying tactics to stifle activism, and to put a chill on speaking out which is why it is so important to expose these tactics. Citizens such as Marily Woodhouse and Brian Vincent should not have to worry about becoming the targets of rich corporations and their monied interests, because they spoke out against harmful practices such as clear cutting which degrades our watersheds.